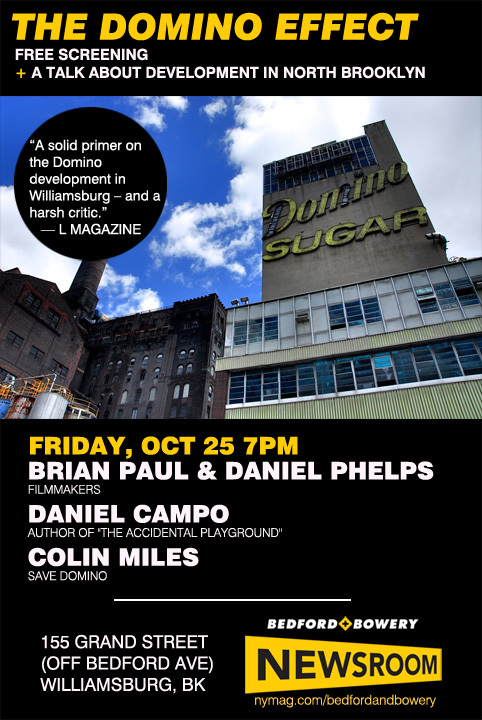 Tonight at the B+B Newsroom we screened The Domino Effect, a film about the development of the Domino Sugar factory. If you missed it, watch online as we speak to filmmakers Brian Paul and Daniel Phelps, Colin Miles of Save Domino, Community Board 1 member Esteban Duran, and Daniel Campo, author of The Accidental Playground, a new book surveying the wilder days of the East River waterfront. More about the event and the film here. Update: The event has passed, but we’ve archived the discussion above. We’ve got just a couple of weeks left at the Bedford + Bowery Newsroom and we’ve packed them with a dizzying/dazzling array of screenings, discussions, and, er, party lectures? We’ll share more about each event as the date nears, but for now here’s a proper schedule so you can mark your calendars. We’ll be livestreaming whenever possible, but your best bet is to join us in person at 155 Grand St., off of Bedford Ave., in Williamsburg. All events are free and start at 7 p.m. unless otherwise noted. Follow us at on Twitter and like us on Facebook for updates. Indie Publishers Press On! 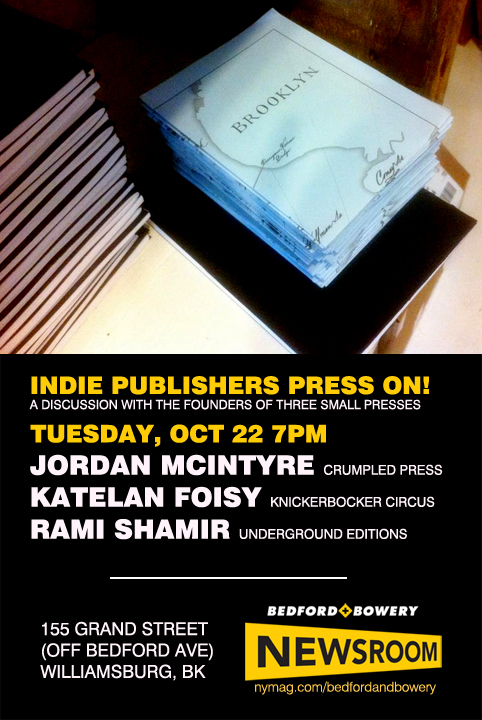 A talk with the founders of three small presses: Jordan McIntyre of The Crumpled Press, Rami Shamir of Underground Editions and Katelan Foisy of Knickerbocker Circus. More here. 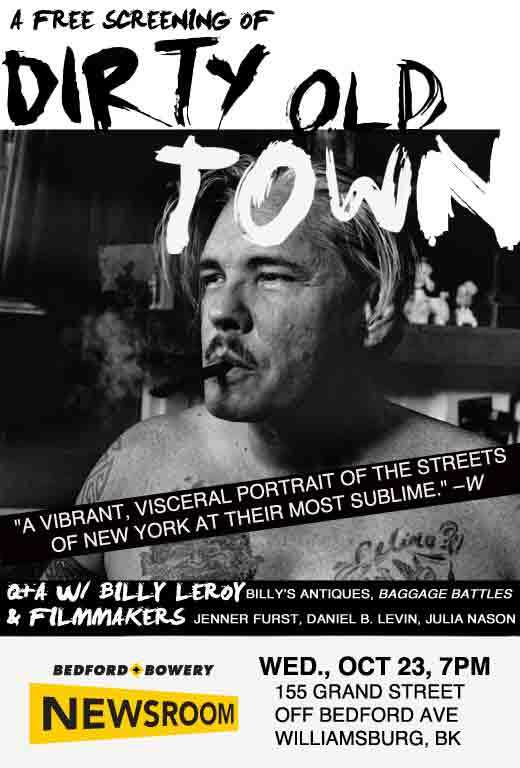 A screening of Dirty Old Town followed by a talk with the film’s star Billy Leroy and filmmakers Jenner Furst, Daniel B. Levin and Julia Willoughby Nason. More here. A screening of The Phantom Tollbooth: Beyond Expectations followed by a talk with director Hannah Jayanti. More here. A screening of The Domino Effect followed by a talk with the filmmakers about development in North Brooklyn. 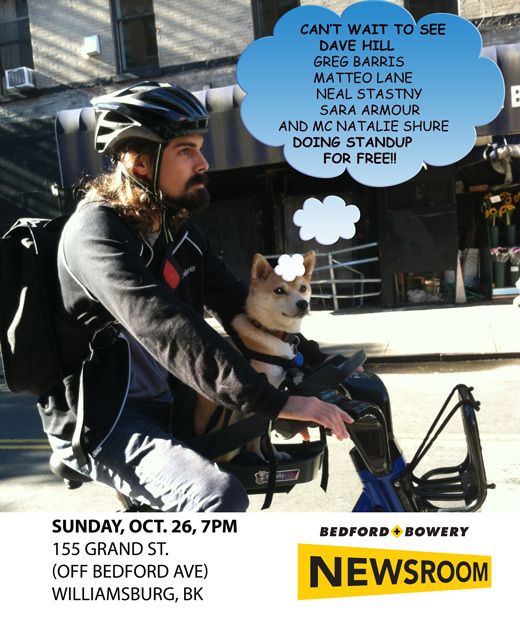 Comedy night featuring Dave Hill, Greg Barris, Sara Armour, Matteo Lane and Neal Stastny. Hosted by Natalie Shure. An Evening with Vice. 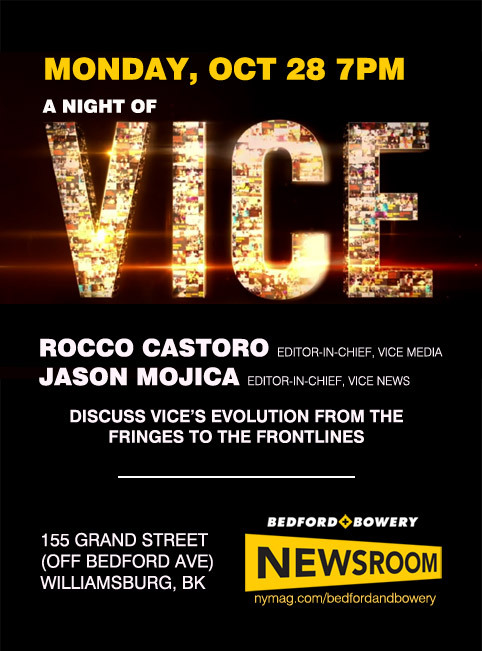 Jason Mojica, editor-in-chief of Vice News, and Rocco Castoro, editor-in-chief of Vice Media, discuss Vice’s evolution from the fringes to the mainstream. 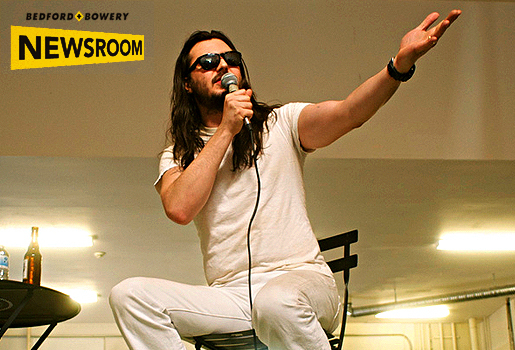 A party lecture by Andrew W.K. featuring wisdom from the musician’s forthcoming book The Party Bible. How to Grow a Label in Brooklyn: a talk with the founders of indie record labels Captured Tracks, Loma Vista, and Cascine. See previous Newsroom events here, and keep checking back — we’re posting footage daily. The Bedford + Bowery Newsroom, 155 Grand. St., nr. Bedford Ave., Williamsburg, Brooklyn; made possible by the John S. and James L. Knight Foundation. 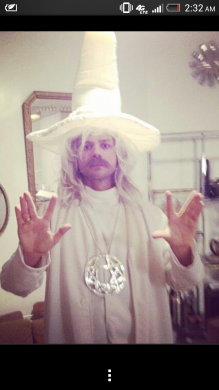 Tuesday at the Newsroom: Indie Publishers Press On! According to popular legend, the death knell tolled for print publishing years ago. But while industry insiders threw up their hands in defeat and the giant Borders crumbled to its knees, there were those in the shadows that refused to hear the bell’s call. Tomorrow at the Newsroom, we’ll talk to some local indie publishers who refused to go quietly into the digital night. Join us Tuesday, Oct. 22, as they speak to the challenges and opportunities facing independent print publishing. As always, the event is free — just let us know you’re coming. Rami Shamir is the author of the acclaimed novel Train to Pokipse and a recipient of the 2013 Acker Award for fiction. 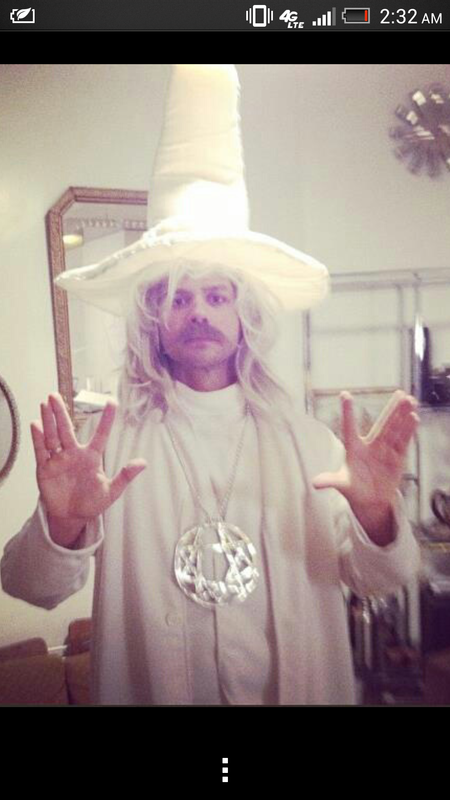 He started Underground Editions in 2011 with partner Adam Void. The pair established a national distribution network of 40 independent booksellers while maintaining a total boycott of its titles from Barnes and Noble and Amazon. In addition to publishing Shamir’s novel, Underground Editions has released three other titles including the train-hopping travelogue from graffiti artists Droid 907 and AVOID, Live the Dream, learn to Die 2. Katelan Foisy is a visual artist specializing in collage and mixed media painting. Her memoir, Blood and Pudding, was called The Best Book of 2010 by Words with Jam magazine. Knickerbocker Circus began in a Lower East Side café in 2009 and was designed to give artists more creative control over their own works and to embrace those artists overlooked by traditional genres. Jordan McIntyre is the founding editor and sole owner of The Crumpled Press, which he began in 2004 to showcase new authors and provided a space for established writers to say something new. McIntrye has published two books of poetry including Crumpled Press’s inaugural publication, Still Leaves.